Aromatherapy massage is the use of aromatic plant oils, including essential oils, for psychological and physical well being. I blend the therapeutic essential oils chosen especially by each individual. The different smells (aromas), and the chemical constituents of the oils, can produce different emotional and physiological reactions. Although aromatherapy has been practiced for centuries in various cultures, the modern version was developed mainly in France. Aromatherapy has not yet undergone as much scientific scrutiny as other complementary therapies, but research so far shows that it can be an effective treatment for some complaints. 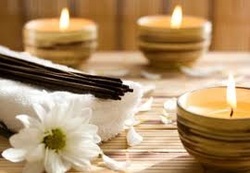 Aromatherapy massage can be of benefit as a form of preventative health care. Aromatic plant oils can stimulate, balance, uplift, soothe and calm and this release of stress and tension can allow the body’s own healing process to begin. Aromatherapy is used to assist with; Digestive problems, Eczema, Headaches, Insomnia, Stress, Acne. Gentle enough to use on babies and children to help settle or calm them. Add a few drops to a natural moisture or cream to assist with nappy rash. This blend can create a positive mood, ease tension and tiredness. Can also assist with acne and lice. Help ease stress and anxiety and my help with sleep. Help balance hormones to assist with mood swings and anxiety. May also be used with an oil or cream to assist with muscle soreness. Uplifting blend that my increase mental clarity and alertness. Can also be used in a diffuser for colds or added to an oil to rub on the skin. This oil is calming and balancing, it may also assist with getting to sleep. It can be added to a natural base cream to aid insect bites and wounds (as long as there is no broken skin). Added to a natural liquid soap it can assist with acne. May help relax and relieve mental tension aiding the onset of the sleep cycle. Only use this oil at night before bed as marjoram can dull the senses. Calms the mind and uplifts the spirits. This blend has uplifting and energising properties. Can also be a great addition to a foot spa or cream to assist with tired legs and feet. Calming but uplifting oil, which can ease emotional stress. May also assist with digestive issues.